As the dark days of winter get colder, I like to add warming spices to nearly everything I make, including that nourishing stand-by, pea soup. 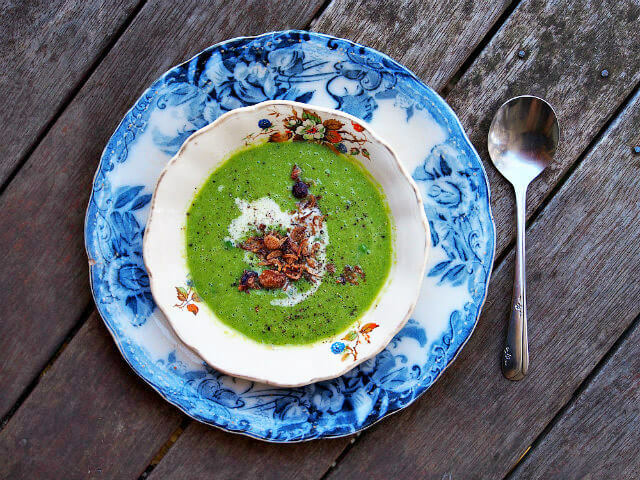 Pea soup often gets a bad rap with its insipid color and distinct lack of zing. 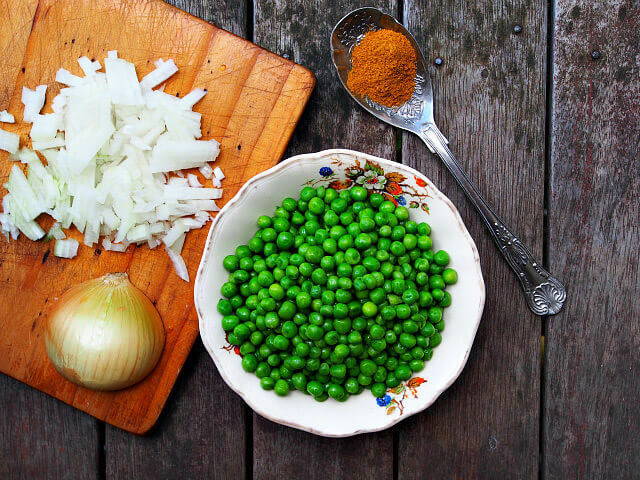 But this curried pea soup, made with frozen or fresh peas instead of dried ones, restores its reputation with a soup of substance, vibrant green color, and deliciously warming curry powder. Curried pea soup begins, as most soups do, with a diced onion fried gently in olive oil until translucent. I then sprinkle in my curry powder and give it a stir to let the heat awaken the spices and get that luscious curry fragrance permeating the kitchen. You can purchase curry powder, or raid your pantry and make your own. It’s simply a blend of cumin, turmeric, coriander, cayenne pepper, ground mustard, ground ginger, black peppercorns, cardamom, and sometimes cinnamon and cloves. Use whole spices, lightly toasted, then grind into a fine powder before storing in an airtight container. The next ingredient is the star of the show, so be sure to choose the best peas you can. 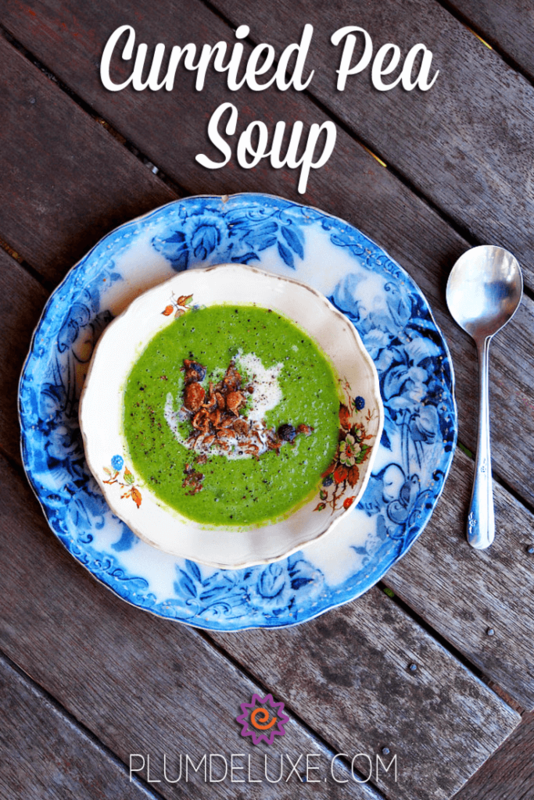 Baby peas cost a wee bit more, but their tender sweetness gives this soup a lovely spring feel. Larger peas work well too, they’re just a bit earthier than their baby cousins. Once the peas are added, I pour in enough stock just to cover the ingredients. A good stock is essential for a good soup. If you can make your own, do. Just pop that leftover roast chicken carcass into a soup pot, add carrots, onions, and celery, maybe a bit of thyme, sea salt, and a spoonful of black peppercorns, then cover with water and simmer for an hour or so until your stock is rich and fragrant. Strain and add to the pea soup. If you don’t have the time or energy to make your own stock, no worries. Choose your favorite store brand and simmer with herbs, peppercorns, and even a few veggies to give it an extra depth of flavor before using. Once the broth is added, cover the soup and simmer for just 5-10 minutes. This isn’t an all day, slow cooker soup. You want the peas to be tender enough to puree, but not cooked so long that they turn the ghastly grey green of dried, old peas. Check them often to make sure they retain their vibrancy. After 5-10 minutes, remove the Curried Pea Soup from the heat. If you have an immersion blender, use it to puree the vegetables until smooth, with no visible lumps. If you only have a standard blender, simply ladle the soup carefully into the jug, making sure you don’t burn yourself, replace the lid, and puree until smooth. Divide the soup into individual bowls, and serve hot with a bit of fresh cream and a sprinkle of salty fried bacon pieces and crispy fried onions. Sliced green onions would also be lovely. For extra spice and warmth, make a pot of Full Moon Chai with sugar and milk, served up in comforting earthenware mugs. Place large sauce pan over medium-high heat. Add olive oil and diced onion. Sauté until onion is translucent. Add peas, stock, curry powder, salt, and pepper, and bring to boil. Cook for 5-10 minutes until peas are soft but still bright green. Remove from heat and puree with an immersion blender until smooth, or pour carefully into a blender and puree until smooth. Divide into bowls and top with a drizzle of fresh cream, a teaspoon of fried bacon pieces, and a teaspoon of crispy fried onions. Serve hot. Want more peas? Try some deliciously cheesy Parmesan Peas or this Fava Bean Salad.